Join the discussion on our forums! Come discuss Astral Rift over in our dedicated Astral Rift discussion topic. Reduce their cost by 1. Draw a card. Gain 5 armor. It's called +1 card advantage. That's what this card gives you. 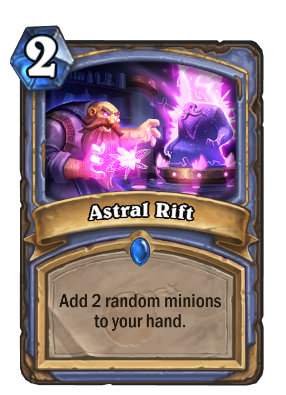 Unstable Portal won games because of the cost reduction. You don't beat a turn 5 Dr Boom or a turn 2 7/7..
More contend for clown fiesta Casino Mage. Could also fit in Elemental Giant Mage. Can't wait to stuff this into my Leyline Manipulator deck. Purely random and unreliable but i like unpredictable cards like this. It will be fun to play with it. Mages are kings of arena again?